At Academia Contacto we take the training of our students very seriously. Therefore, every week we have different activities in our Spanish academy that help to improve the learning of Spanish. The activities are fun and motivating and help all students to learn Spanish in an entertaining way. If you like dancing, singing, meeting people and enjoying a drink, this is your Spanish academy! Activities change every week. This way, you will be able to try your favorites, since they will have different schedules. We love that you learn and have fun at the same time, so we want you to try as many as you can. Meet & Dance. It is one of the most fun dance activities. You will learn to dance salsa, bachata and merengue. It's Monday at 22:00 in the Cool Room. You will meet people from other cultures and dance with them until you end up dead! Karaoke. If you feel like Freddie Mercury when you pick up a microphone, you'll love our karaoke night! It's Tuesday at 22:30 in the Nomad room. You can enjoy a drink and sing as well as you can on stage - it's sure to be super fun! Language Exchange & Meet & Beer. This Wednesday we have two fun activities. On the one hand, you can download the "Meet Up" app and meet people and do language exchange in "La Cordobesa". You will have a fun and entertaining afternoon, you will meet a lot of people and learn from each other. It's at 18:30 and it's completely free. Secondly, this Wednesday we also have Meet&Beer. If you like to meet people with a beer in your hand... This is your date! It starts at 19:00 on Manuela Malasaña Street. It's one of the coolest places in Madrid. You can't miss it! Meet & Speak. That's the activity we have this Thursday for you in the Soho Club room. Having fun is much easier than you think. To do this, you just have to come with us and enjoy as much as possible. You will meet new people and exchange languages. In case you missed the Language Exchange activity on Wednesday, you can enjoy it again on Friday! It's a really fun and enriching activity, so we don't want anyone to miss it. Also, on Friday, you can enjoy meet & taste. With this activity, you will eat the best tapas in Madrid while you get to know each other a little better. If you don't have plans for Friday, can you think of anything better? At Academia Contacto, besides having fun activities from Monday to Friday, we also have excursions with which you will get to know a little more about this magnificent country. Learning Spanish is even more interesting if you do it with the right activities. First we have an excursion to Toledo on Saturday 9 February. It's a day trip. Toledo is a very beautiful city that is close to Madrid. The best marzipan is in Toledo! We will walk its streets and enjoy delicious food. A charming city that you have to see yes or yes. 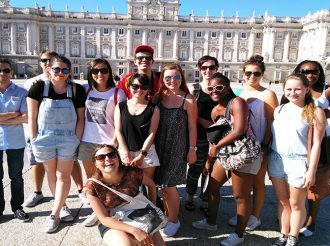 Secondly, we can teach you Segovia and El Escorial. Here you can taste the best suckling pig and feel like a real Spaniard. The road is beautiful and the city even more so. This activity is on Saturday 16th. Finally, if you are a nature lover, the guided mountain tour is one of the best activities. We will walk through the Sierra de Guadarrama (Madrid), as long as the weather is right. This excursion takes place every Saturday. Are you going to miss it? Please, do our online test without help, guessing or the use of dictionaries. It should not take you more than 10 minutes. If you don’t know an answer, please skip that question. You made it! Please fill in your personal data and we'll let you know how well you did on the test! Let us know about yourself, your family, your hobbies and your aspirations… if possible in Spanish. It’s all part of the test! We are sorry! An error occurred while sending the test for evaluation. Please try again later, the test will be kept if you don't clear your browser's cache. The website admin has been notified. Thank you! Your test will be evaluated and we will get in contact with you as soon as possible to let you know how well you did.